With fantastic powder skiing, great value for money lodging, easy access for international skiers, and an endless array of non-snow activities, Silver Star Mountain Resort is at the top of our list of the best family-friendly ski resorts in Canada. Here are Scout’s top reasons why Silver Star is the perfect choice for a family ski vacation this coming Winter. Getting to/from ski resorts can sometimes be stressful, especially for international skiers with kids in tow. Frequent direct flights operate daily to Kelowna International Airport meaning a quicker connection between the major cities in Canada, including Vancouver and Calgary. 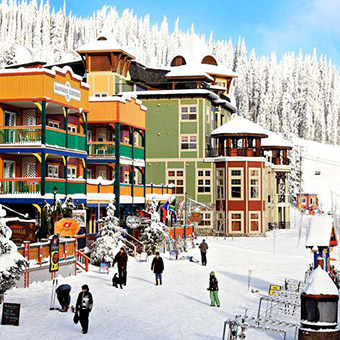 Silver Star resort area is also only 1 hour from the airport, making it one of the closest ski resorts to an international airport in Canada, and keeping the dreaded travel time to a minimum. One of the challenges when booking a family ski vacation is finding the perfect accommodation option. Silver Star ups the ante when it comes to family-friendly hotels, self-contained condos, and townhomes, all conveniently located close to the compact resort village. Offering ski-in/ski-out, or barely minutes shuffle from the slopes, choose from a range of options to suit any budget. Plus, many offer flexible bedding arrangements, full kitchens, spacious lounge rooms, and plenty of storage for all the family’s snow gear. Easy access to rental shops, snowsports school and retail shops means everything is within walking distance. SilverStar Mountain Resort also offers a complimentary ski shuttle services to get you to and from the Village, the Knoll, Alpine Meadows, Firelight, and Creekside. It’s cute and quirky and what makes Silver Star so incredibly popular with families. Weatherboard buildings with a patchwork of bright and happy colours line the main central ski plaza, which are home to a variety of restaurants and cafes, shops, bars, and the snowsports school. This mid-mountain village provides convenient access to the slopes each morning, and for rest stops throughout the day, plus is a far cry from the large resort base areas often seen at major resorts in the Northern Hemisphere. It’s easy to keep an eye on the kids with a distinct lack of crowds at Silver Star. Silver Star boasts incredible terrain for every ability level in a family. Every chairlift offers at least one green run allowing families of varying ability levels to ski together throughout the day. Families with first-timers will love the beginner area with it’s easy-to-ride magic carpets, located right in front of the main central village area. Scout loves this as it allows easy access to the day lodge, cafes, and resort facilities to keep the little ones happy on the slopes all day long. The runs are also tailored to progression, meaning a week skiing in Silver Star is bound to improve your skiing. For families with kids that rip, the Front Side boasts nicely gladed areas where they can try their hand at some tree skiing, while the Back Side offers the ultimate in black and double black runs. The slopes are rarely crowded, and while the village may have a hustle and bustle in the mornings, the vast spread of the terrain means skiers are evenly dispersed and lift lines are minimal. They’re the three magic words that parents love to hear when planning a family ski vacation – Kids Ski Free. Silver Star boasts some of the best value offers and package deals that allow families to experience the best of the Canada without breaking the bank. With ‘Kids Ski & Rent Free’ deals combined with fantastic Early Bird Deals including Stay 7 Pay 5, a family ski vacation has become even more affordable than ever. When the little ones are tired of skiing, or just seeking some fun on a down-day, Silver Star offers a huge variety of non-snow activities to keep them entertained. Let them rip around a designated track on mini-snowmobiles, or try their hand at ice-skating and ice-hockey on the outdoor rink. Join a snowshoe tour or horse sleigh ride to experience the Canadian wilderness, or head indoors and unwind with an afternoon of bowling or rock climbing. There’s even an option to immerse themselves in a local ice-hockey match, with night-time tours run by the resort. 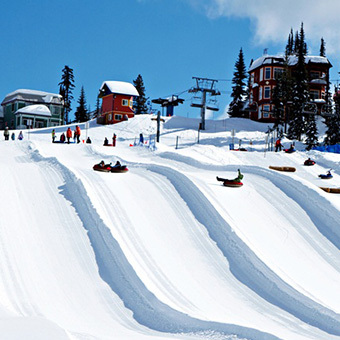 Stay for a week or a month, there’s plenty to do for the whole family at Silver Star. 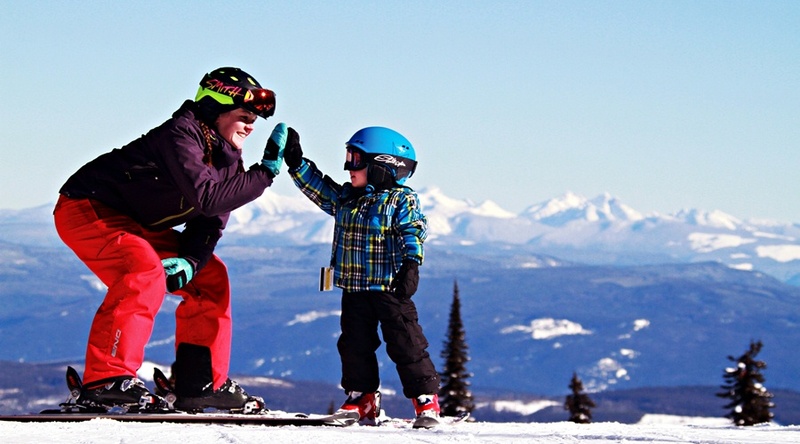 Whether the kids are first-timers, intermediate skiers, or just want to ski with other like-minded kids, Silver Star offers a fantastic range of ski and snowboard programs, daycare, and winter activities that are sure to tire out the little ones. Full and half day lessons are available for kids aged 4 years and above (7 year and above for snowboarders), as well as popular Adventure Weeks, which combine skiing or snowboarding with the many non-snow activities on offer at the resort. For those parents who are avid skiers, the school offers Breakfast Clubs, Afternoon Activities, and After Lesson Clubs to keep an eye on the little ones whilst you get your powder fix. The Kids Night Out program also allows parents to score some much needed rest and relaxation while the kids expel the remainder of their energy at a disco, karaoke, making snow forts, and tubing. Check out our deals for Silver Star Mountain Resort & book a Silver Star family ski package on Scout.